First Dental Visit: Why Age 1? The Academy of American Pediatric Dentistry recommends that children visit the dentist for the first time by age 1, or within six months of getting their first tooth – whichever comes first. So why is age 1 the magic number? Isn’t this too early? You may feel that it is silly or unnecessary to bring your “gummy smile” baby or toddler to the dentist for the first time. However, this appointment serves many important purposes. For starters, there are several dental health issues that can occur by this early age. Before the age of two, your child can have excessive bacteria build-up along the gums after feedings. They don’t have to be on solid foods or have a full set of teeth to have harmful oral bacteria. Remember that the gums are the foundation of your child’s smile, so keeping the gums in top condition is important. This includes brushing them gently every day, even with a damp washcloth at first. Bacteria that is left on the gums can start to accumulate on the teeth as they emerge, causing cavities in that new toddler smile. The risk of gum or tooth injury is also high at this age, as babies are learning to walk and don’t have the dexterity or coordination to avoid certain accidents. 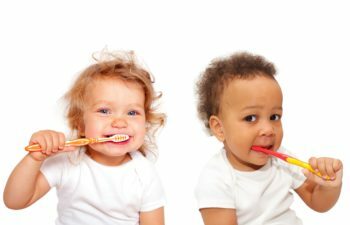 While first dental visits at age 1 can help prevent cavities and other dental health issues in the child, they are just as important for the parents. During this appointment, the pediatric dentist will take time to educate the parent about how to care for their child’s teeth and gums at this early stage. In addition, parents learn how to detect potential problems early on. Last but certainly not least, dental visits at such an early age help establish a positive relationship with the dentist. This can greatly eliminate fear and anxiety in your child as they get older and more aware of the dental office. By fostering a comfortable and positive association with going to the dentist as a baby, they are more likely to grow up with a confident and proactive approach to dental care in general. To schedule your child’s first dental visit in Milton, GA, call Milton Dental Specialists today. We treat children from babies to teens with comprehensive dental care and orthodontics.